Over-the-top distribution is all the rage in media circles these days, but one area where the direct-to-consumer model hasn’t completely taken off yet is with individual sports franchises. Although leagues commonly take the lead on live-streaming services to mobile devices, tablets, and connected devices for television screens, teams are sitting on a wealth of content created for websites and social-media platforms. The Minnesota Vikings and the team’s Vikings Entertainment Network are blazing trails in this space, going after connected devices designed for the big screen at home by being the first NFL team to debut an app — Vikings Now — across three platforms: Apple TV, Roku, and Amazon Fire TV. The Vikings Now app offers NFL Network segments and highlights. 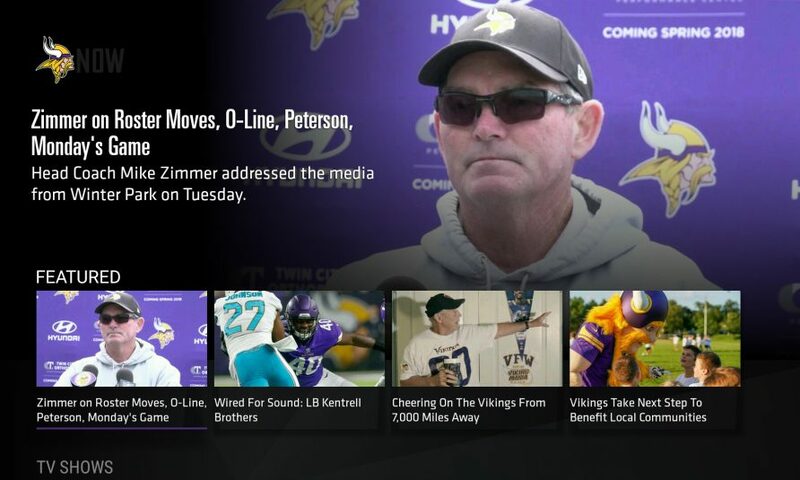 The Vikings Entertainment Network already produces loads of content for web and social media, including three original programs actually designed for television: Vikings Connected, Beyond the Gridiron, and Vikings Gameplan. Those shows are traditionally broken up into pieces for distribution across web and social media. Now OTT offers the Vikings a chance to see if long-form content is the type of content his fans are interested in watching in that environment. The Vikings were able to build this OTT experience through a partnership with online-video-platform company dotstudioPRO, which specializes in getting media clients up and running quickly in an AVOD and/or VOD/SVOD environment quickly to drive viewership and monetize content. The app includes NFL Network segments and highlights and is free to download on Apple TV, Roku, and Amazon Fire TV. Kegley notes that there has been fan interest in seeing the app introduced to more platforms, including gaming consoles and other streaming devices. The team will focus on the three platforms it has launched with this season and assess how much and where it would like to grow following this season.